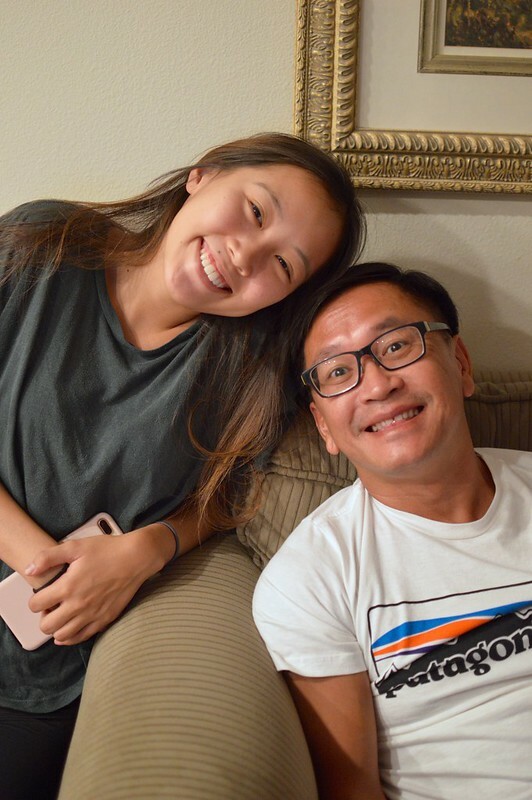 ‘Twas a S’Autumn Family Dinner…. What’s S’Autumn? It’s when it’s technically Autumn but the weather acts like we’re in the peak of Summer. Which for inland Orange County–that means the mid-90s. Ugh. 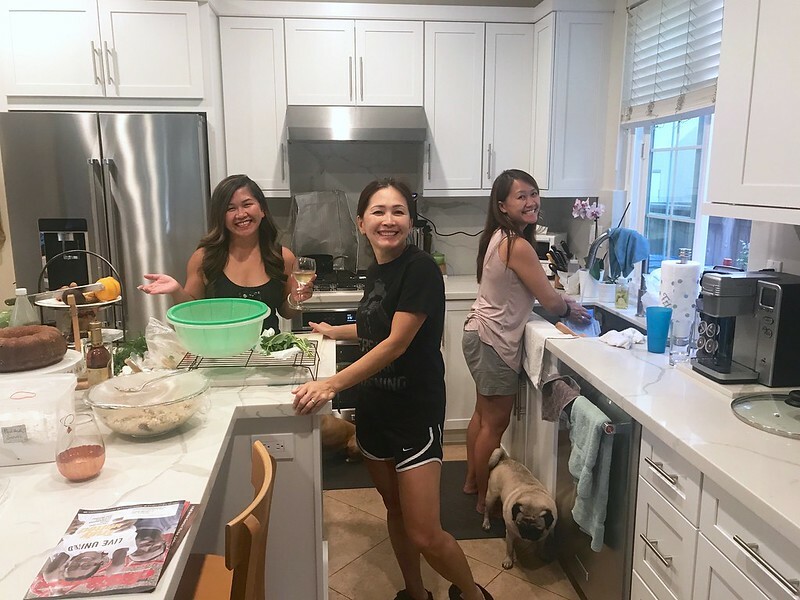 It kind of makes our dinner themes a bit difficult which results in a mish-mash of dishes…. a bit theme-less. But delicious, nonetheless. Or maybe it’s called F’ummer? S’all? Eh, I’ll stick with S’Autumn…. After doing a little prep work, I got to fixing up a cocktail to match the heat we were having that day – SHANDIES! Shandies are a beer based cocktail that typically combines a wheat beer and a lemonade. That’s it? Yup–that’s it! 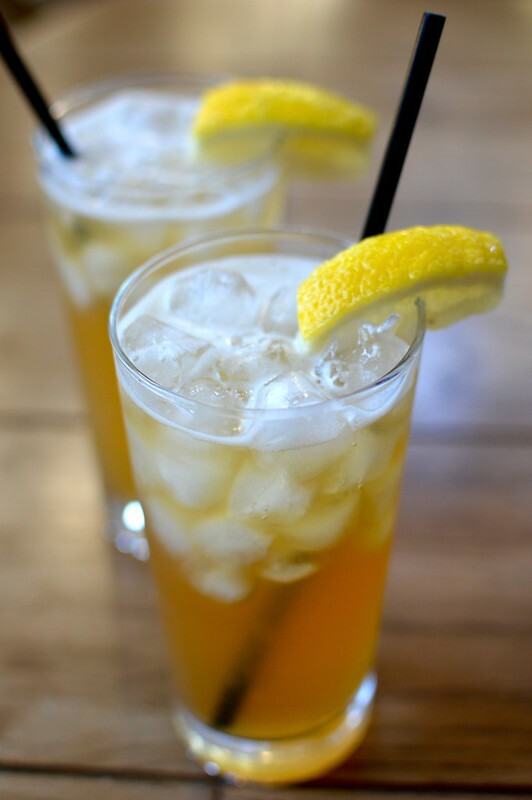 These refreshing lovies were made with a Hefeweizen and a sweet lemonade. Because shandies are so dandy….yeah–I had to do it. Leia is still trying to figure out what S’Autumn is. 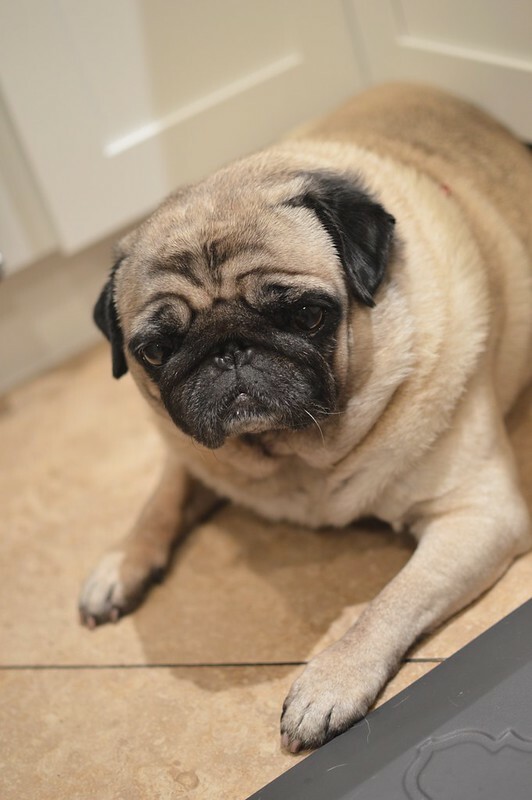 It means whatever you want it to be, you glorious pug. S.I.L. L was hankering for some duck for dinner and picked up a whole bird from Electric City Butcher in Santa Ana. 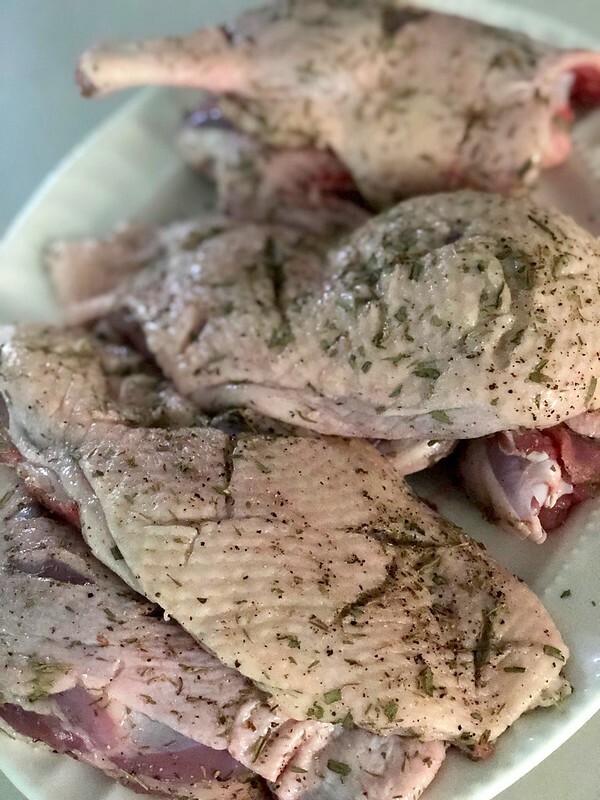 She seasoned them up with salt, pepper and dried thyme…..
….and then threw it in a bag with some rendered duck fat to sous vide for a few hours. Because after all, she and brother V were the ones who gave me the Anova so it only seemed right for her to take a spin with hit. 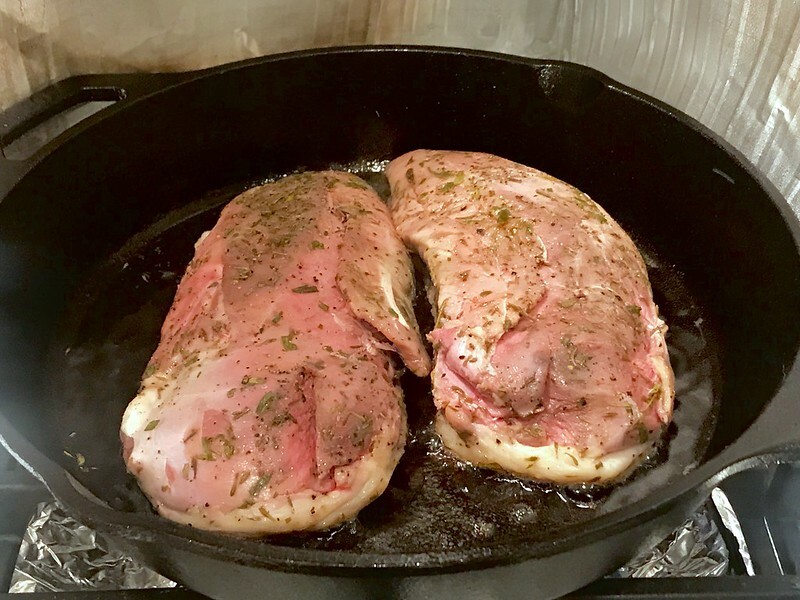 The breasts went in at 130 degrees F for 2 hours. While the duck was taking a dip, the girls were giving me this look. 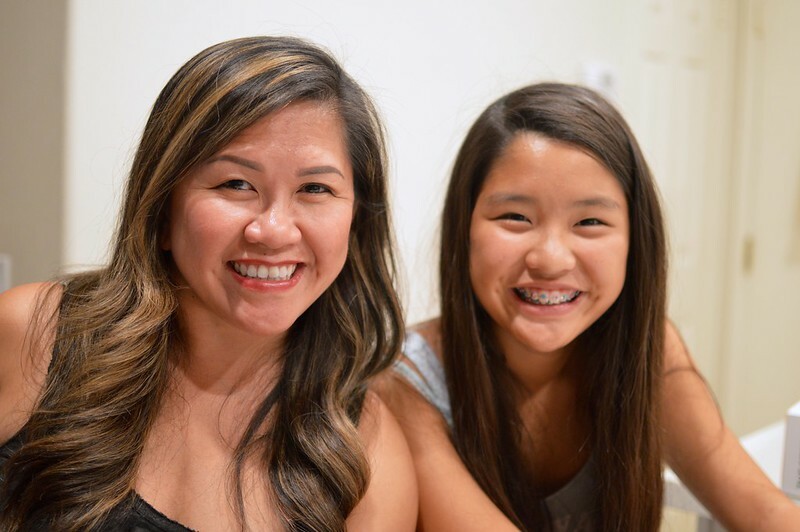 Which interprets to: We’ll smile for the camera but we’re starving so feed us some appetizers before we get hypoglycemic. And that look is all I need because I have lived through their hangry phases. It’s scawie. I made two appetizers to tie the fam over until dinner. 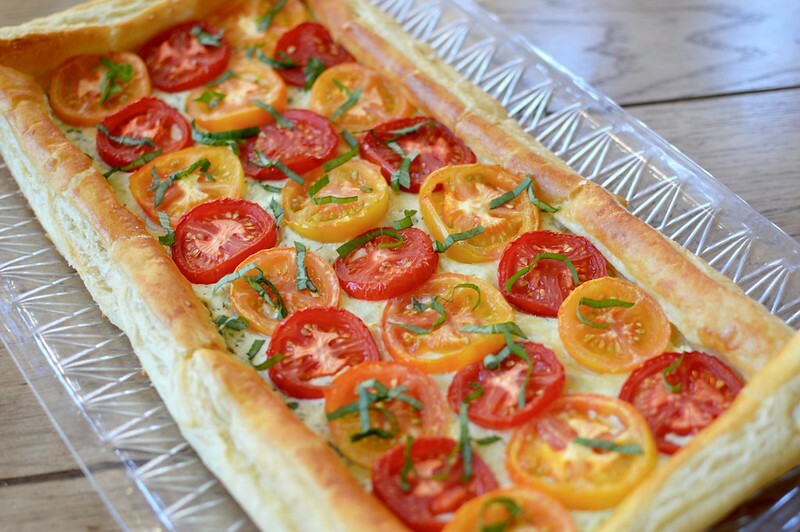 The first was this colorful Heirloom Tomato and Pesto-Ricotta Tart. Isn’t she a beaut???? And guess what? It starts with store bought puff pastry–because ain’t no one has got time or patience to make their own! 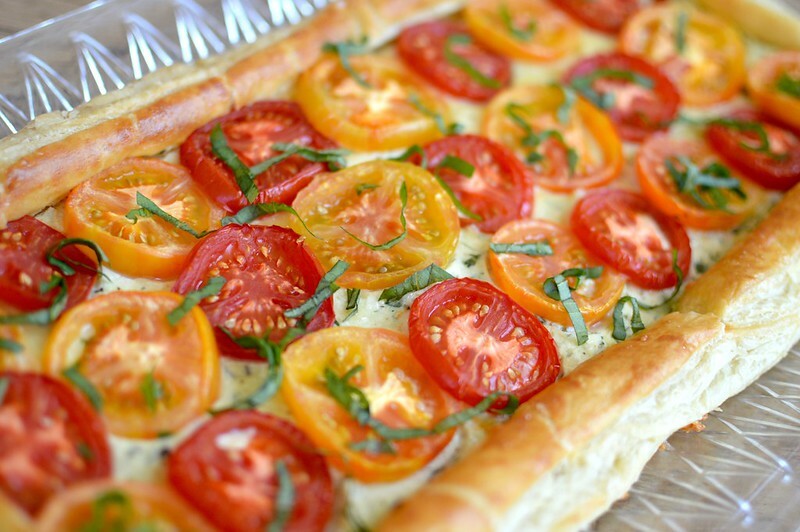 I then smeared it with a thin layer of a pesto and ricotta mixture — and then shingled it with sweet, ripe tomatoes. The whole thing baked in the oven for about 25 minutes and was finished with large sea salt flakes and fresh basil. 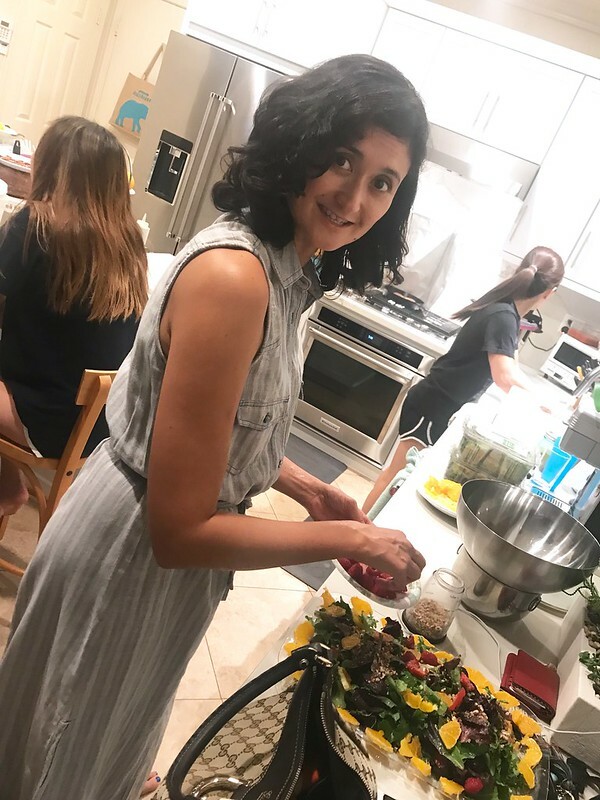 It’s definitely one of those appetizers I make that would be perfect as a stand alone entree on a warm summer day with a chilled glass of white vino. 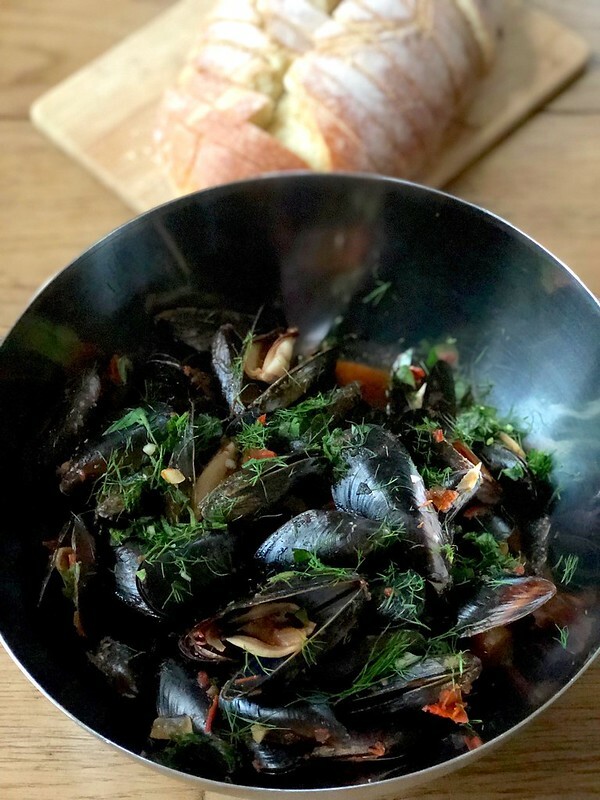 And for my second appetizer, I made a big pot of Tomato-Fennel Mussels served with lots of crusty warm bread to sop up all that goodness. The base that the mussels cooked in comprised of onions, garlic, fennel, wine, clam juice and San Marzano tomatoes. And once the mussels steamed opened, they released their own sea liquor into the mix and it was divine! Absolutely scrumptious! Definitely another appetizer that could have been a stand alone with just a loaf of bread or even over some pasta. The rest of us gave a brief silent pause and then collectively bursted out in hysterical laughter. By the way, I got them at Costco. 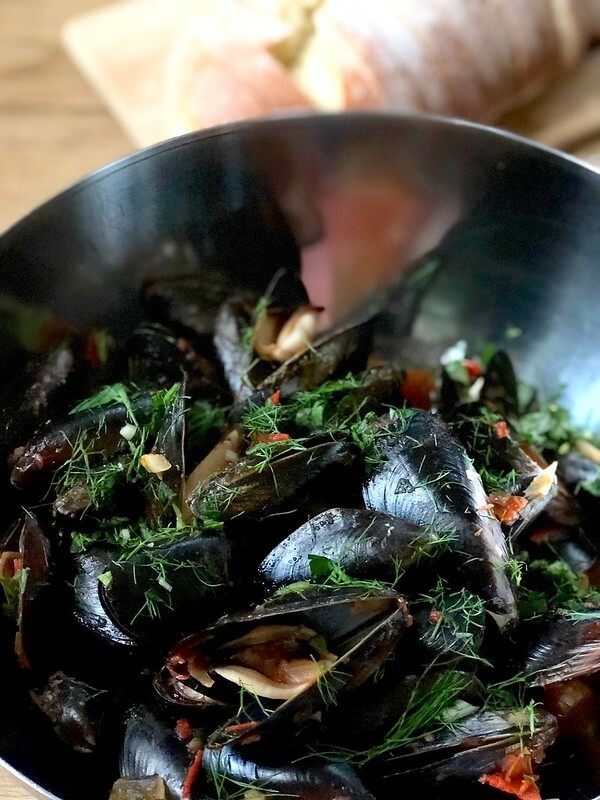 The mussels, not Maya’s fierce muscles….I can’t take credit for those guns. And then the two hours were up! L dried off the duck and threw them into a cast iron to crisp up the skin and finish them off. 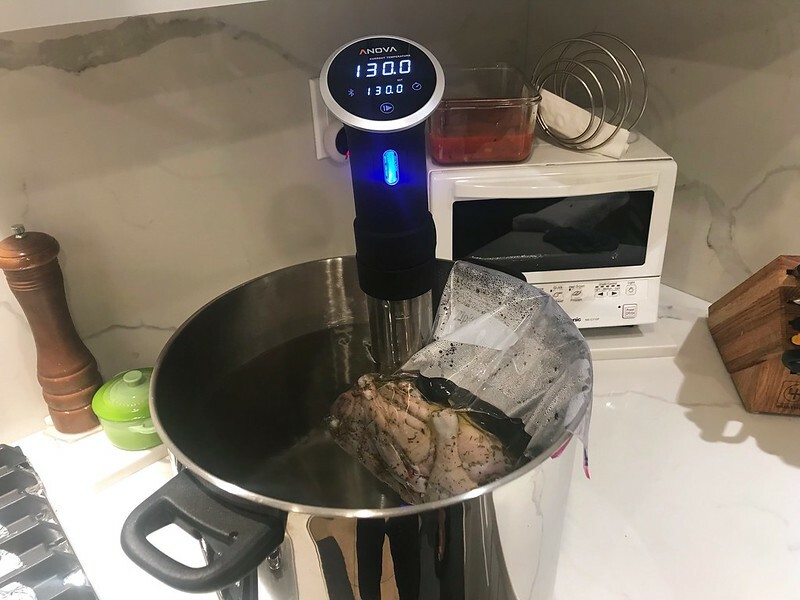 Man… that sous vide is the business. 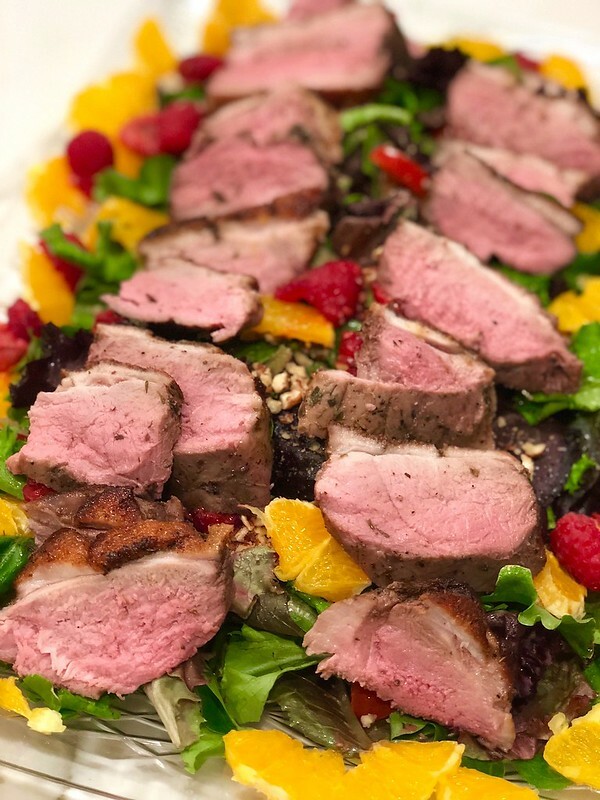 She then placed the sliced duck over a bed of greens, orange segments, raspberries, nuts and a light vinaigrette. 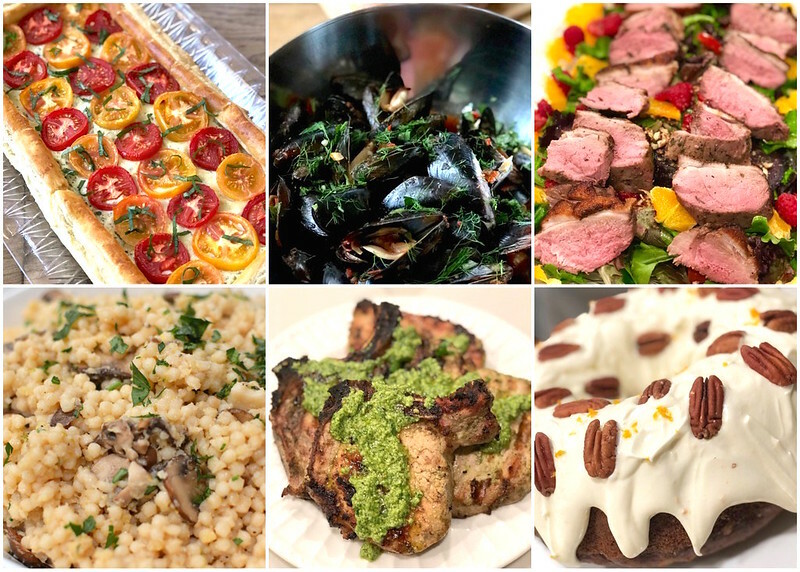 A great showing of summer transitioning into fall–don’t you think? And then T was up to bat with the main course! 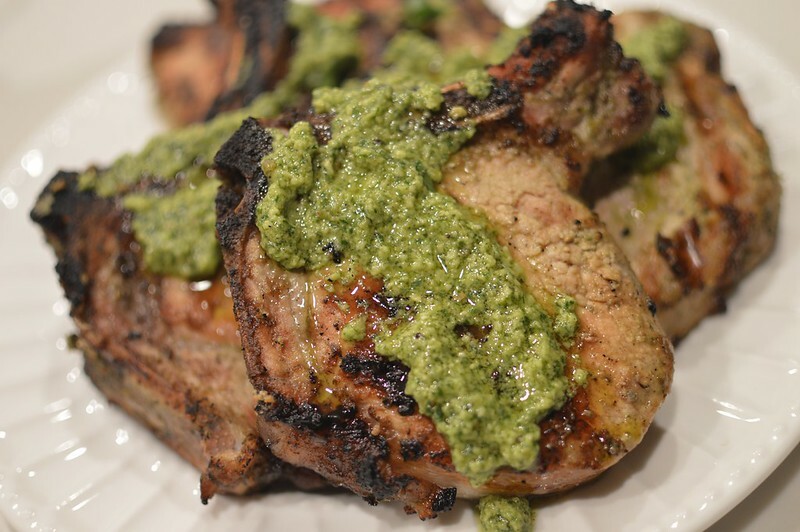 She took a spin on Jamie Oliver’s Grilled Pesto Pork Chops. 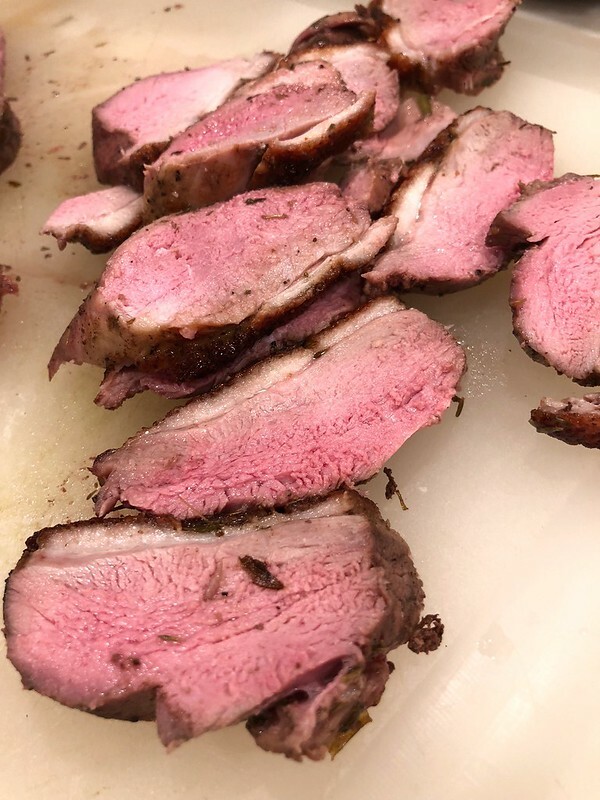 Initially she wanted to sous vide them as well (because we’re addicted) but when she picked them up, she found that although they were thick chops, they’d be fine straight on the grill. 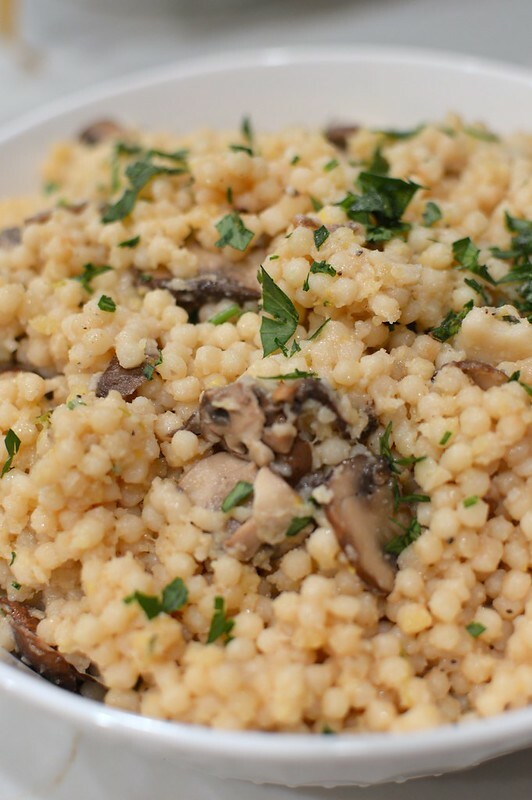 T served them with this super cheesy Parmesan-Mushroom Israeli Couscous. And I’ve got to tell you, as a super carboholic, I was all about it. It actually resembled risotto and y’all know how much I love me some risotto! 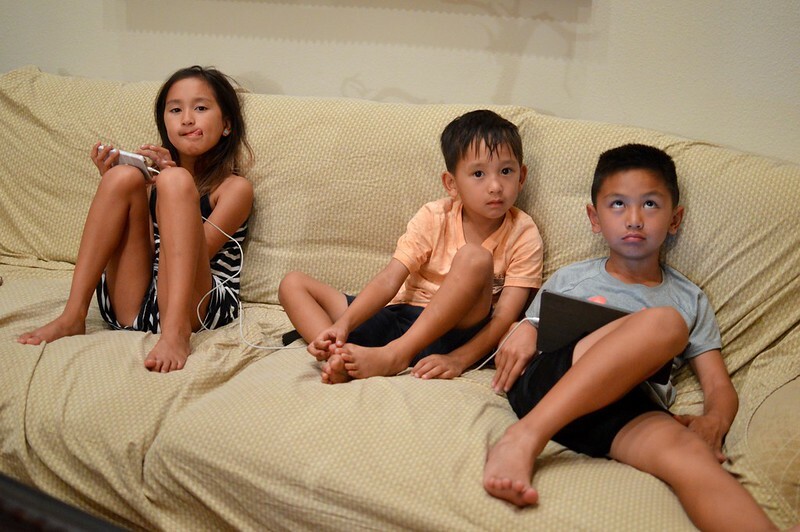 And this is the point when we gave in and let the younger munchkins get on their devices. At least they were all playing in some virtual world together, right? Sometimes you just have to make some concessions…particularly while we were trying to hold them over before dessert. 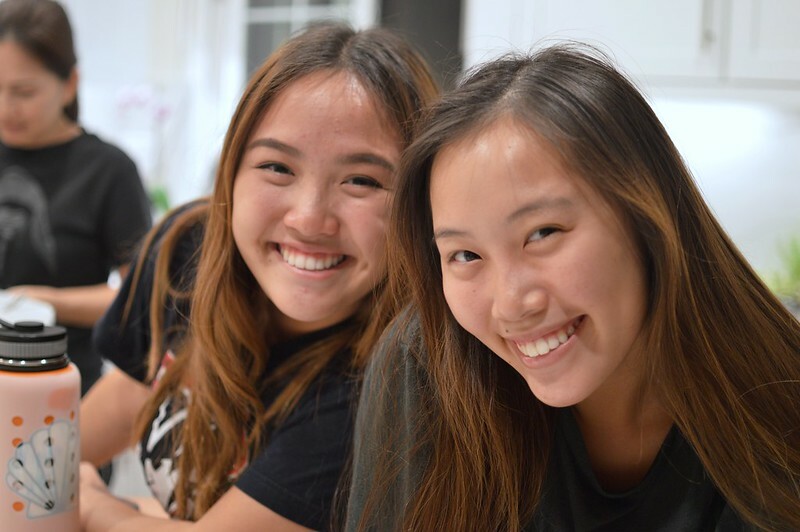 Yes Nina and V, it’s almost dessert time. Wowsers, N! Now that’s some frosting! 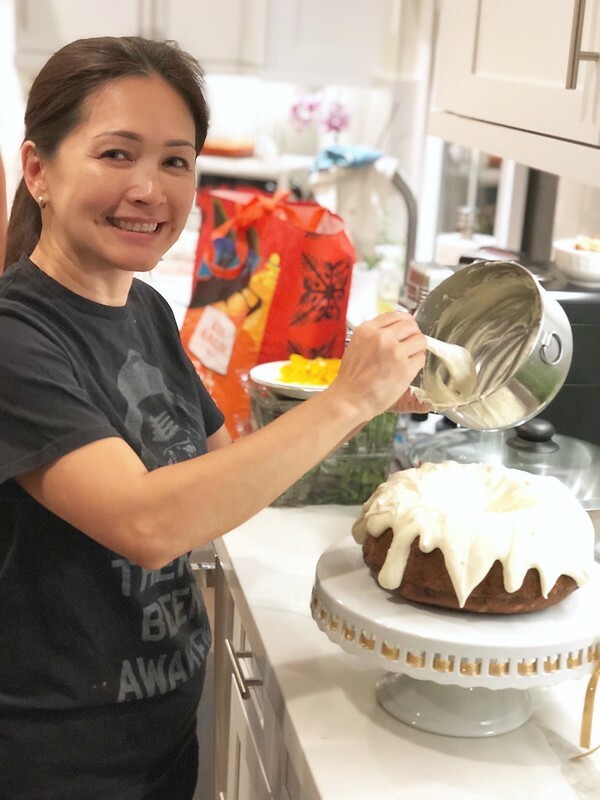 Cream cheese frosting that is—one of my faves! 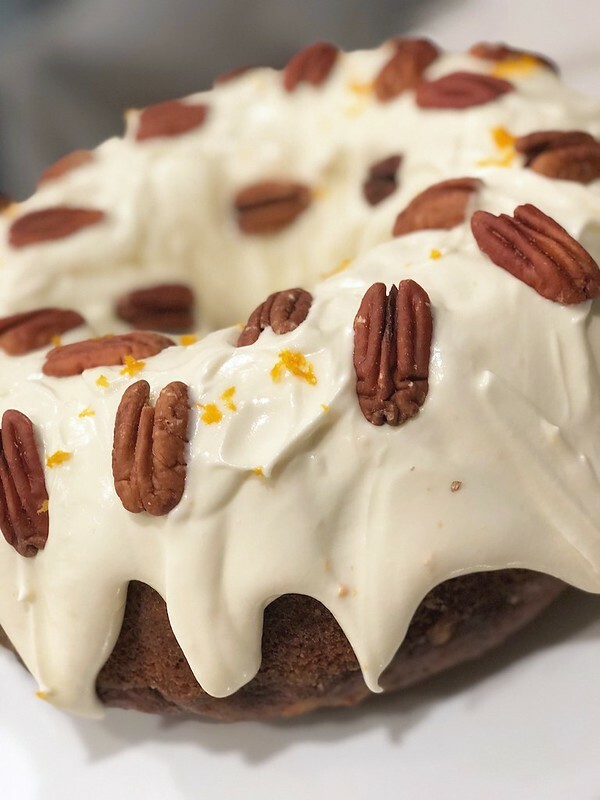 N ended up making this Hummingbird Cake which is a traditional southern goodness with pineapple chunks, bananas, vanilla and lots of spices. It may seem odd if you haven’t had it before but the pineapple just gives it the lightest sweetness and moisture—essentially it tastes like a kicked up spice cake with lots of cream cheese frosting. Now please Mother Nature… turn down the thermostat so that we’re back at our normal 74ish degrees for Fall.